The markets opened weak yesterday when the ECB announced no new policies. The ECB is out of options. 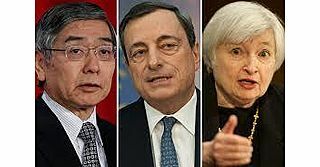 Mario Draghi has cut rates into NIRP four times and spent nearly €1 trillion in QE. Looking at the EU’s inflation rate, you wouldn’t think the ECB had done anything. Inflation peaked at 0.2% and is now negative again. Spot the impact of the ECB’s policies… you can’t. Fortunately, “someone” manipulated the markets higher after the ECB disappointed. The manipulation was so obvious it’s ridiculous. Apparently “investors” were desperate to panic buy stock futures from 10AM until 4PM. But then magically, those same investors ceased to exist and the market flatlined for over 12 hours trading within a 3 point range. This is the kind of action you expect in banana republics, not the US. And all of it only shows you how desperate the Central Banks are growing. The time to prepare for this bubble to burst is now. Imagine if you'd prepared for the 2008 Crash back in late 2007? We did, and our clients made triple digit returns when the markets imploded. We're currently preparing for a similar situation today. This is it... no more extensions... no more openings.